The boundaries created in group sequential trials depend on the type of the alternative hypothesis and the early stopping criterion. Table 90.2 shows the boundaries created with various design specifications. For a two-sided design, the null hypothesis is accepted only if both the null hypothesis is accepted with an upper alternative hypothesis and the null hypothesis is accepted with a lower alternative hypothesis. For a one-sided design with a lower alternative, only the lower boundaries are created. Similarly, for a one-sided design with an upper alternative, only the upper boundaries are created. For example, Figure 90.19 shows the boundary plot for a one-sided test with an upper alternative. Figure 90.19 corresponds to a one-sided sequential design with early stopping to reject or accept the null hypothesis. For a sequential test with early stopping only to reject the null hypothesis, there are no acceptance boundary values at interim stages. The acceptance boundary value and its associated acceptance region are displayed only at the final stage. Similarly, for a sequential test with early stopping only to accept the null hypothesis, there are no rejection boundary values at interim stages. The rejection boundary value and its associated rejection region are displayed only at the final stage. For a two-sided design, both the lower and upper boundaries are created. 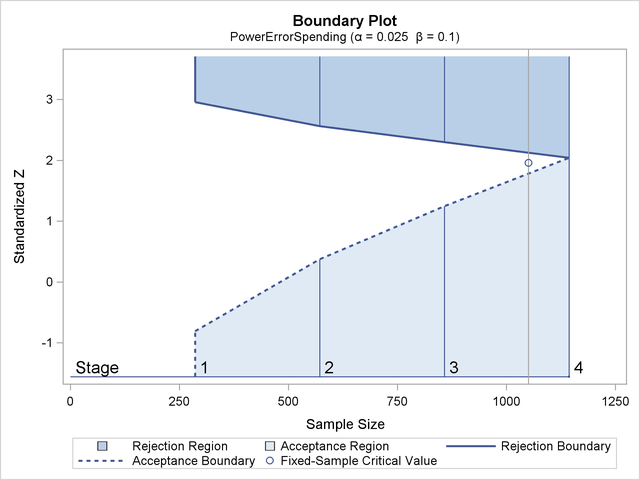 For a design with early stopping to reject the null hypothesis, boundaries are created. Similarly, for a design with early stopping to accept the null hypothesis, boundaries are created. For a design with early stopping to accept or reject the null hypothesis, both the and boundaries are created. 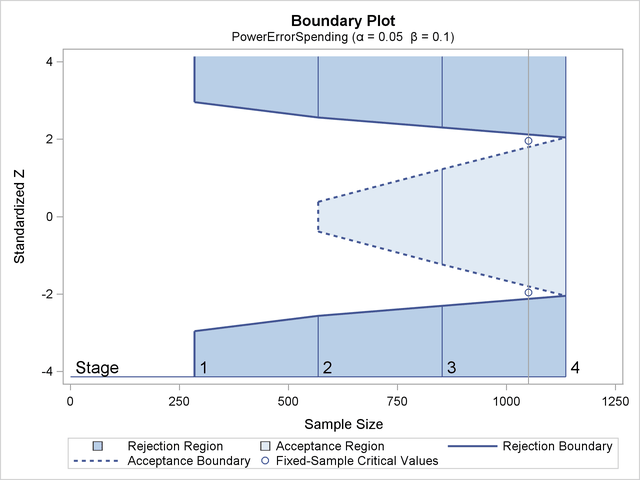 For example, Figure 90.20 shows the boundary plot for a two-sided test. Figure 90.20 corresponds to a two-sided sequential design with early stopping to reject or accept the null hypothesis. For a sequential test with early stopping only to reject the null hypothesis, there are no acceptance boundary values at interim stages. The acceptance boundary value and its associated acceptance region are displayed only at the final stage. Similarly, for a sequential test with early stopping only to accept the null hypothesis, there are no rejection boundary values at interim stages. The rejection boundary value and its associated rejection region are displayed only at the final stage.